I love cherries. 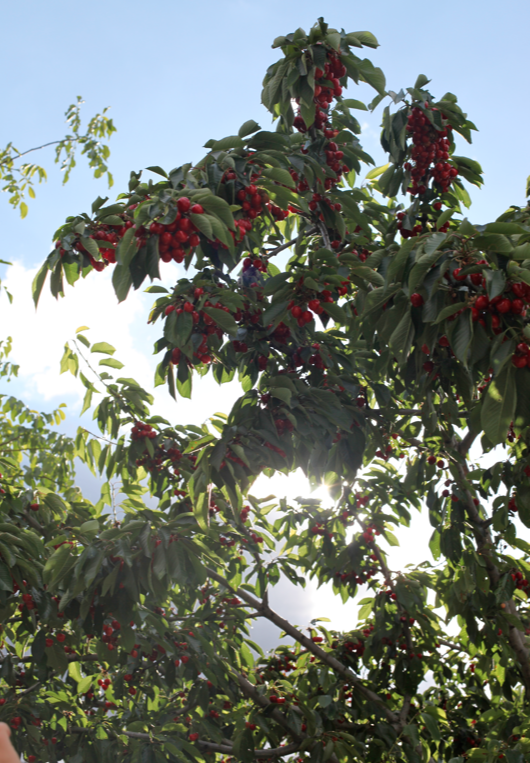 I've been waiting all winter long to hand pick cherries in the Spanish sunshine. On a recent trip to the Andalusia region, we hiked the Sierra Nevadas and picked pocket ( shirt, shoes, anything!) 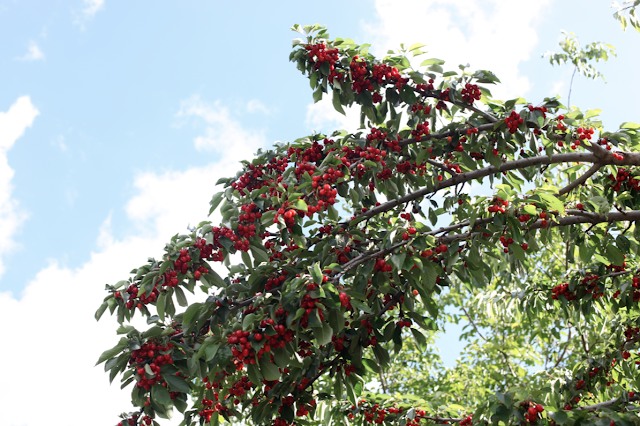 fulls of cherries dripping off the abundant trees scattered throughout. If you are in the mood to make a scrumptious little dessert, try making some Cherry-Almond Galettes. 1 Preheat oven to 425 F (220C). Cut six 5 1/2 inch (14cm) rounds of the puff pastry and place on a parchment paper-lined oven tray, top with parchment paper and another baking tray and bake until deep golden (10-15 minutes). 2 For cherry compote, halve and pit cherries, leaving 8-12 whole. Combine with sugar in a saucepan and stir over medium heat until sugar dissolves and liquid seeps from cherries (3-5 minutes). Keep warm. 3 For almond crumble, roast almonds until golden (2-4 minutes), chop in a food processor until coarsely ground, add sugar and pulse to combine. 4 For soured cream, whisk crème fraîche, cream, icing sugar and vanilla in a bowl to soft peaks, cover and refrigerate. 5 Serve puff pastry rounds topped with cherries and almond crumble scattered over and soured cream on the side. Yum! I recently made a couple of cherry-almond pies (with almond paste, though.) Cherries taste like summer. THAT'S what cherries look like on the branch?! mindblowing! !